(TibetanReview.net, Feb10’16) – Organizers of an art exhibition in Bangladesh’s capital Dhaka were forced to cover up the Tibetan section of their gallery at a prestigious summit because of objection from the Chinese ambassador, reported indianexpress.com Feb 8. The section at the Dhaka Art Summit paid homage to 149 Tibetans who had carried self-immolation protests against Chinese rule in their homeland and consisted of letters drafted by five of them before they set themselves afire. The report said that as visitors combed through several galleries on Feb 7 at the Bangladesh Shilpakala Academy — which hosted 17 solo projects, five exhibitions, eight durational performances, film programmes and book launches — they found one wall with five frames on the first floor covered with white sheets of paper. The work covered by the shroud belonged to the filmmaker couple Ritu Sarin and Tenzing Sonam who are based at Dharamshala, India. Titled “Last Words”, it was part of the duo’s earlier exhibition, Burning Against the Dying of the Light, which portrayed the Tibetan struggle. This was the third edition of the summit organized by the Samdani Art Foundation, headed by Nadia and Rajeeb Samdani. Sarin has accused China of “bullying”. “The Chinese are asking for the works to be removed in a foreign country. We have just taken five letters that are actually available online; it is not even an interpretation,” she was quoted as saying. 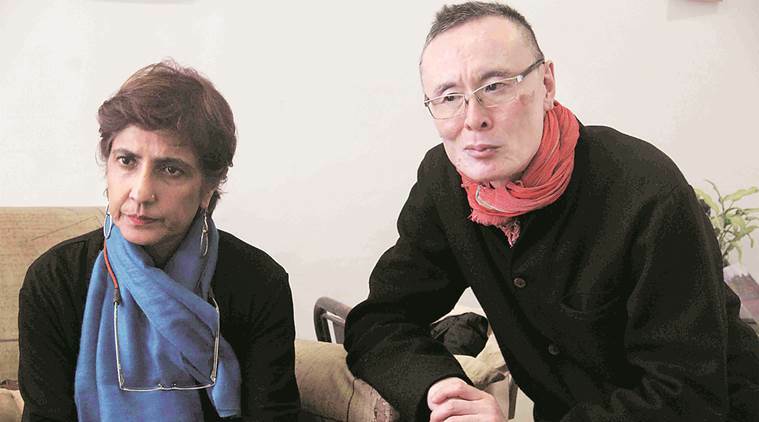 The installation that travelled to Dhaka was one of several works that were part of the couple’s solo exhibition that took place at Khoj Studios in Delhi from Dec 10 to 31. Despite the Chinese objection and the following unfortunate development, Sonam is elated by the public response to the Tibetan exhibits. “In Bangladesh too the response was wonderful. A lot of people found it very moving and shocking. Many people don’t know much about the Tibetan movement in Dhaka,” he was quoted as saying. Earlier, in 2009, the Chinese embassy had asked the government of Bangladesh to shut an exhibition titled “Into Exile | Tibet 1949 – 2009”, featuring the journey of “Tibetans from their Homeland to Exile”, organised by the Students for a Free Tibet, Bangladesh. “I had forgotten about that incident but now all of it is coming back,” Sonam has added. The organisers have refused to comment.